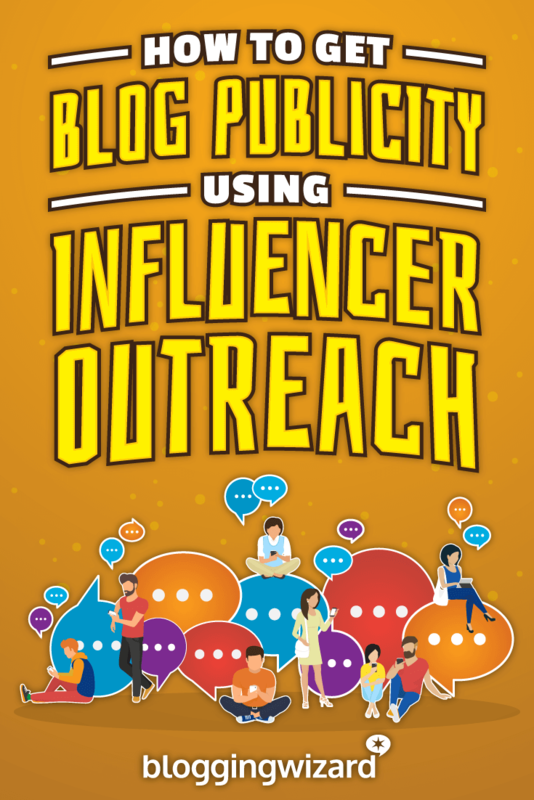 Do you think an outreach campaign that gets you engagement from the TOP influencers in your niche can help grow your blog? The challenge though is that top influencers are flooded with messages and tons of requests each day. So don’t be surprised if you hit a wall of…silence. Adam has successfully used influencer marketing to grow Blogging Wizard and in this post, he made a promise. So I decided to take this approach and put it to the test. Can you really get the guys at the top to engage with you? Here is the influencers “hit list” list I got for this campaign: Neil Patel, John Lee Dumas, Pat Flynn, Derek Halpern, Adam Connell, Brian Dean, Jon Morrow, Lewis Howes, Kristi Hines, Kim Garst, Ian Cleary, Matthew Barby, Stuart Walker, Matthew Woodward, Danny Iny, Noah Kagan, Chris Brogan, Francisco Rosales, Peep Laja, Ana Hoffman, Shane MeLaugh. Have you spotted Neil Patel? How about Jon Morrow, from the awesome SmartBlogger? Or Danny Iny from Mirasee? If you’re active in the online marketing world, you probably recognize some of the top bloggers in the market. 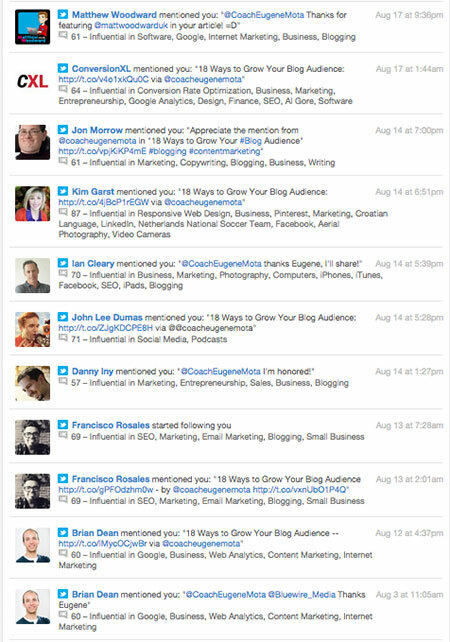 All of them were featured in a new article on my blog: 18 Ways to Grow Your Audience Fast. Now that the post was written, I planned to get in-touch and let them know about it. However, I didn’t jump right into the outreach phase. As per Adam’s formula, there are a few steps you need to follow before. So let’s see what I did. I started to engage with the influencers mentioned above, months or at least one week before initiating contact via email, to a minimum. This included mainly commenting on their blogs, sharing their content and engaging via social media. Then, in the post I published on my blog, I referenced them as experts in a specific area related to growing your blog audience. All these steps were designed to add value to them. I added to the engagement level around their content and I helped drive awareness for them being experts in the field. This is in line with Adam’s advice of doing something for them first. Once the pre-outreach phase was completed, I moved on to the juicy part. Now that I added value to the guys on my list, it was time to get in-touch and let them know that I included them in my blog post. Of course, I would have loved them to share my post, as well. However, I didn’t make any such specific request. I just let them know that they were featured as experts on my blog. Then it was up to them if they shared it, linked to it or ignored it. The default medium I used to get in-touch was email. I know you might want to see right away the message I used. However, upon consulting also with Adam, we decided we would actually do a disservice to you if I shared the specific wording I used. Because templates lose their strength the moment they are overused. Big name bloggers start receiving the same message over and over again and this does not serve you well. We believe that the process of drafting your own message is super important and will help you get great results with your future outreach campaigns, as well. No worries, though! I’ll walk you through how I used Adam’s framework to draft a winning message. This means using the influencer’s name, but also trying to customize the message via using something specific to the blogger you write to. Prove that you know and value the content they share. I have created a templated message but tried to adapt it for each influencer, starting from a recent post on their blog or from something differentiating I love about their work. Most people send a “me” focused message. Don’t do that. Instead, focus on how you can add value for the influencer. In my case, I referenced them as experts in my post. As I promote the post, I help spread their content and strengthen their personal brand. I believe Adam’s advice on how you position the ask is critical. Try to keep the influencer’s interest at heart at all times. For example, if you pitch a guest blog, show how this would be beneficial for their audience. In my case, I didn’t make any request. 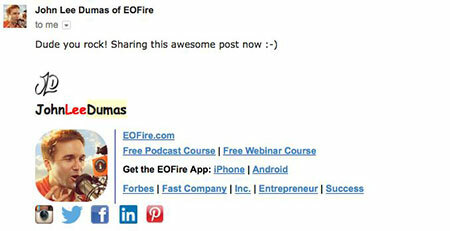 I just used strong personalization and let them know they were featured in my post. The ask is somehow more obvious, even if not expressed in words. I deliberately took a soft approach, as my main goal was to start building long-term productive relationships. However, if you pitch a guest post for example, you need to make a clear and specific request. This step is critical to stand out of the crowd and improve your response rate. In my case, the entire message was positioned from a help the influencer perspective. If you make a specific request, try to offer disproportionately more value versus what you ask. Say for example that you pitch a guest post. How can you adopt a “help again” mindset and find multiple ways to add value? Will you promote the post? Will you be happy to answer each comment and engage with readers? This is the point when you let them know who you are and make it easy for them to find out more about you. My main objective was to build relationships, remember? So I tried to make it easy for the influencer to connect my name to my face. This will help in the future, when I’ll also engage via comments on their blogs or via social media. To this end, I ended all messages with a signature that includes my photo. I’m using Wisestamp for that, but you don’t necessarily need it. I suggest that you draft your own email message template, taking into account the elements above and the tips shared by Adam. If you need a bit more inspiration, check out this great collection of outreach templates put together by Dave from NinjaOutreach.com. But what if some of them don’t react to your email? After a few days, I checked who engaged with me and who didn’t. Remember that influencers receive tons of messages. In the Quicksprout.com contact page Neil Patel shares that he receives 207 email per day. And in a recent interview, he actually mentioned he now gets 400 messages per day. For this campaign, Neil sadly did not answer my email message. But hey, it was time to get creative and figure out what communication channel he is more responsive to. As Neil answers all the comments he gets to his posts, I went ahead and engaged with him in this way. For the others who didn’t answer via email, I just let them know via a Twitter @mention that I included them in my post. And I got 2 more answers this way. Similarly, if you know that someone is active on Google+, you can share your post and tag them and they’ll receive a notification. For this campaign I didn’t do this, but it’s the same principle I used with Twitter @mentions. The learning is to pay attention what communication channels a certain influencer prefers. If you don’t get an answer to your email, try an alternative channel, but without being pushy. Now a short story and one word of advice: double-check that you spell the influencer’s name correctly! I misspelled the name of John Lee Dumas in my blog post. Oops! I guess he wasn’t incredibly impressed with me, contacting him for the first time and letting him know that I published a post with his name spelled wrongly. Luckily, John is an amazing guy. He just let me know about the mistake, I corrected it and then I linked in my blog post to even more resources he offers to his audience. John then went ahead and shared the post with his audience. Speaking of results, I strongly agree with Adam, in urging you to follow a long-term strategy when it comes to influencer marketing and blogger outreach. While you can set the objectives of an outreach campaign in terms of traffic and number of email subscribers, you’re better off if you focus on building long-term relationships. In time, if you build strong relationships with influencers, if you add value to them and to their audience on a regular basis, this will definitely help you build a sizeable audience of your own. I measure the success of this outreach campaign by the level of engagement I got. This is because each engagement is a first step towards building a productive relationship. So let’s see what we’ve got. I got 17 out of the 21 contacted influencers to engage with me in one way or another. Some of them shared the post, others just thanked me via a short message. Or they both sent a message and shared the post via social media. You can see that many of the influencers went ahead and shared my post, even if I didn’t specifically asked for a share. There are other influencers who simply thanked me for including them in the post. This is still great. I’m into this for the long term and I’ve made a first step towards building a relationship. I mentioned above Neil Patel. He didn’t answer my email message and didn’t share the post. So all in all, the blogger outreach formula shared by Adam works great. You can also use it also to pitch guest posts, ask influencers to take part in a group interview, share your infographic and so on. You’ve seen the results of a specific influencers outreach campaign. And for a long-term perspective on what’s possible to achieve, just take a look at BloggingWizard.com. Adam lists productive relationships with influencers as a key factor in growing this blog all the way to the top. Eugene Mota helps entrepreneurs grow profitable blogs and businesses online. To boost your traffic, while building your list and turning subscribers into profit, get in-depth guides and actionable cheat sheets at EugeneMota.com.